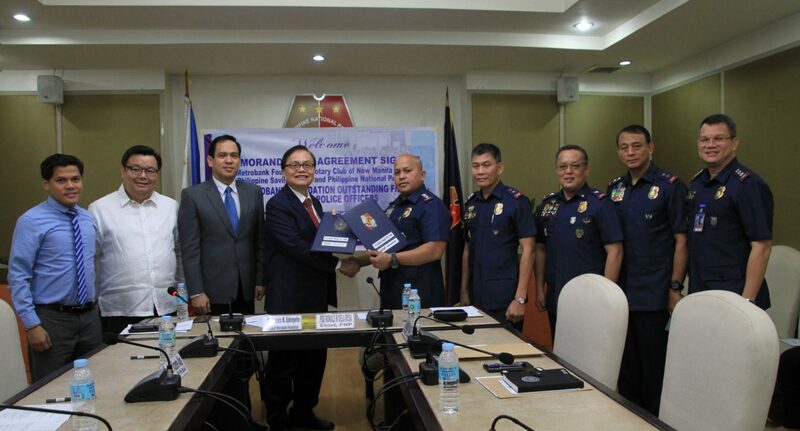 A ceremonial signing for a three (3) year Memorandum of Agreement (MOA) among Metrobank Foundation, Inc. (MBFI), Rotary Club of New Manila East (RCNME), PSBank, and the Philippine National Police (PNP) for the conduct of the Metrobank Foundation Outstanding Filipinos – Award for Police Officers was held last January 30, 2018 at the PNP Headquarters, Camp Rafael Crame, Quezon City. Present during the MOA signing were Police Director General Ronald Dela Rosa (5th from right); Metrobank Foundation president Aniceto Sobrepeña (4th from left); the new head of the Directorate for Police Community Relations, Police Director Eduardo Serapio Garado (4th from right) who delivered his welcome remarks highlighting the role of his office in the conduct of the award-giving program, institutional partners representatives from RCNME president Christopher Ponce (3rd from left); and PSBank executive vice president Jose Vicente Alde (2nd from left). Also in attendance were past outstanding police officer awardees who are currently holding key positions at the National Headquarters – Police Director Cedrick Train (2nd from right), Police Chief Superintendent Rhodel Semonia (3rd from right), and Police Senior Superintendent Mario Rariza, Jr. (rightmost). The MOA signing also marked the 15 years of partnership among the parties in recognizing outstanding uniformed men and women PNP.